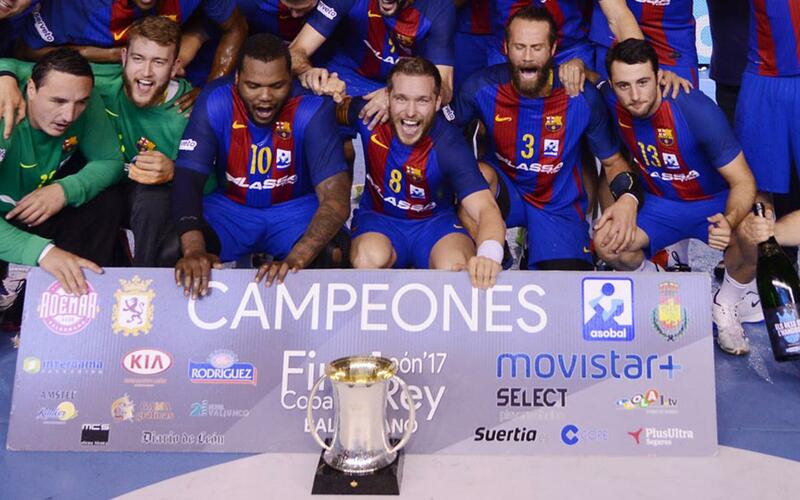 The Copa del Rey Barça Lassa won in León on Sunday was the best ending to the 16/17 season. The fifth trophy of the season was particularly special for various players. For some because it was their last in a Barça shirt and for Víctor Tomás because he enhanced his legendary status at the Club with another incredible statistic. The Barça Lassa captain has now won 50 trophies as a blaugrana. It has been 14 years since Víctor Tomás won his first trophy with Barça Lassa handball’s first team, the Copa EHF in 2002/03. The past fourteen years have been full of effort, improvement and success. During this period of success, the team hasn’t failed to win a trophy in any of Víctor’s campaigns with the Club and he added the 50th of his blaugrana career. The 50 trophies are spread out over eight different competitions. Víctor Tomás has won a Copa EHF, three European Cups and eight Asobal leagues titles, eight Copa del Reys among others. After this new achievement, Víctor has become the active player with the most trophies and he is now chasing Barça handball legends David Barrufet (71), Xavier O’Callaghan (54), Enric Masip (53), and Iñaki Urdangarín (52), who all played with the Dream Team of the 90’s. Jesper Noddesbo said goodbye to Barça Lassa as the second player currently active with the most titles on 39. Next season, Víctor Tomás and the rest of the team will continue to try and add to their fabulous record both individually and as a team.